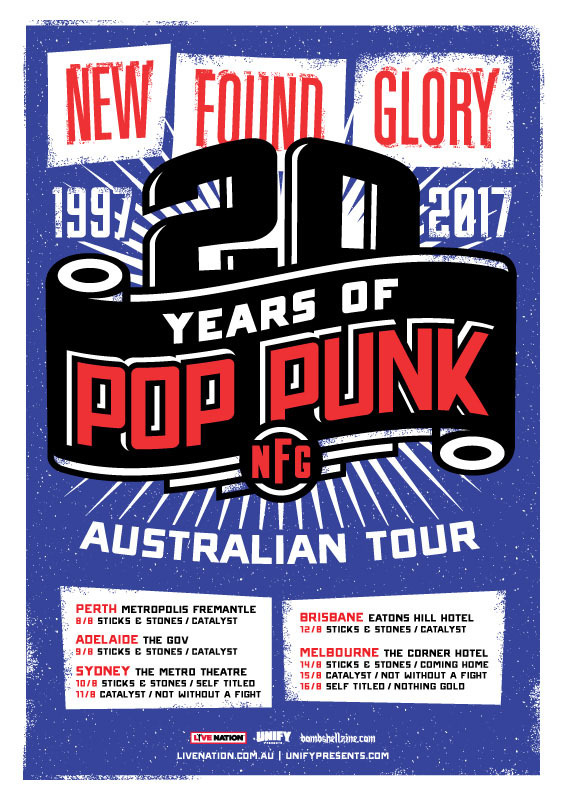 The godfathers of pop punk New Found Glory will be heading to Australia this August for a very special 20 Years of Pop Punk anniversary tour. To celebrate two decades as a band, New Found Glory will be playing two classic albums in full each night for an evening of nostalgia and infectious punk anthems. Back in the country for the first time since 2015, each night New Found Glory will play two select albums from their discography prior to 2010 in full. Perth, Adelaide and Brisbane will be treated to a night of 2002’s Sticks and Stones and 2004’s Catalyst, meanwhile Sydney will see two nights with Sticks and Stones / Self-Titled (2000) at the first date, followed by Catalyst / Not Without A Fight (2009) at the second. Melbourne will be treated to their entire pre-2010 catalogue with Sticks and Stones / Coming Home on night one, Catalyst / Not Without a Fight on night two and Self-Titled / Nothing Gold Can Stay will on the final night of the tour. Over their span of 20 non-stop years in the music industry, New Found Glory have released eight studio albums, one live album, two EPs, three cover albums and are considered a key pioneer of the genre. The band has been playing together since the musicians were only in high school, breaking out of Florida to become one of the most influential pop punk bands of our time. The group has headlined Warped Tour, toured with Green Day and performed on the main stage of festivals like Reading and Leeds, their songs connecting positively and universally with fans around the world. New Found Glory are currently preparing to release their ninth studio album, Makes Me Sick, on Friday 28th April. The album was produced by Aaron Sprinkle (MxPx, Anberlin, Acceptance) and mixed by Tom Lord Alge (U2, The Rolling Stones, Blink 182). The first single Happy Being Miserable can be viewed below. General public tickets on sale 11am Friday March.